Introduction: Pheochromocytoma surgery is associated with significant hemodynamic and metabolic changes that require post-operative monitoring. We prospectively evaluated the trends of blood pressure, blood sugar, body mass index (BMI), and quality of life (QoL) changes in a cohort of patients undergoing pheochromocytoma surgery to determine the minimum duration of monitoring and assess factors that could predict these changes. Materials and Methods: Consecutive patients undergoing surgery for pheochromocytoma over a 20-month period were included in this ethics review board-approved, prospective cohort study. Blood pressure and sugar levels were serially monitored using a fixed protocol in the perioperative period and subsequently at 3 months after surgery. BMI and QoL (using World Health Organization Quality of Life [WHOQOL-BREF] questionnaire) were recorded at baseline and 3 months. Changes were compared and assessed for the predictive factors. Results: Twenty-six patients undergoing 31 procedures were included in the study of whom 8 (30%) developed hypotension and 4 (15%) developed hypoglycemia after surgery. All hypotension episodes occurred within 6 hours of surgery. However, while 3 of the 4 patients who developed hypoglycemia manifest in the first 4 h after surgery, one occurred after 12 h. Occurrence of hypotension correlated with preoperative 24-h urinary vanillylmandelic acid (VMA) levels (P = 0.02) and the total daily dose of prazosin (P = 0.04). Out of 21 hypertensive patients, 7 (33%) had persistent hypertension (HTN) at 3 months and this was associated with age (P = 0.04) and diabetes mellitus (DM) at presentation (P = 0.04). Among six diabetic patients, 1 (16%) had persistent DM. There was significant increase in the BMI (P < 0.0001) and in WHOQOL-BREF scores postoperatively. Conclusions: Hypotension occurs in 30% patients and hypoglycemia in 15% after pheochromocytoma surgery. Hypotension occurs immediately but hypoglycemia may manifest upto 12h after surgery. Older, diabetic patients are more likely to have persistent HTN. Surgery results in increase in BMI and improvement in QoL. Pheochromocytomas (PCs) and paragangliomas (PG; when they are extra-adrenal in origin), are rare neuroendocrine tumors, leading to excessive catecholamine release and are an important cause of secondary hypertension (HTN). Surgical extirpation is the primary management with minimally invasive surgery being the standard approach., However, meticulous preoperative and intraoperative management is required in order to avoid hemodynamic instability and these patients are prone to develop postoperative hypotension once the source of excessive catecholamines is removed. In addition, PCs are known to cause diabetes mellitus (DM) due to increased gluconeogenesis and glycogenolysis caused by the excess catecholamines and after tumor removal, these patients can experience profound hypoglycemia which, if not detected, can be fatal., It is thus important to monitor these patients in the early postoperative period for hypotension and hypoglycemia. However, the duration and frequency of such monitoring are not established. Further, in up to 50% of patients, HTN may completely resolve over time, and up to 90% of diabetic patients may become euglycemic after the surgery along with changes in body mass index (BMI) which could impact their quality of life (QoL). In a prospective cohort study of patients undergoing PC surgery, we aimed to identify the factors that may predict blood pressure and sugar changes and determine the time period when such changes occur. This may help determine which patients need to be monitored closely and for longer time. In addition, we assessed the prevalence of persistent HTN and DM, changes in BMI and changes in the QoL after surgery in this group of patients. In an Institutional Ethics Committee-approved, prospective cohort study between October 2015 and July 2017, all consenting patients undergoing surgery for PC were included. PC was diagnosed on the basis of biochemical and radiological evaluation using the standard criteria. [Figure 1] shows our institutional protocol for the evaluation of PC/PG. Nonsurgical candidates and patients with metastatic disease were excluded. Preoperatively, elevated blood pressures were optimized using combinations of antihypertensive agents with alpha-antagonists as the initial medication. Prazosin was the primary alpha-blocker, and calcium channel antagonists were added if the pressure control was inadequate. Beta-antagonists were added to control tachycardia resulting due to alpha blockade. The end-point of preparation was a normal blood pressure with little or no orthostatic hypotension and hematocrit below 40%. Patients were encouraged to take about 4–5 l of water every day and up to 5 g of salt per day to enable volume expansion. As a protocol, even normotensive patients were prepared with alpha blockade and volume expansion. Data were prospectively recorded in an electronic database. Preoperative parameters included demographic data, clinical and tumor characteristics, BMI, and 24-h urinary catecholamine levels. Baseline blood pressure and glucose levels and antihypertensive and antihyperglycemic agents with their respective doses were also recorded. QoL was assessed using the WHO-HRQOL proforma in either Hindi or English depending on patient's preference of language. In case of illiterate patients, any literate relative read out the questions to the patient and filled the proforma. Operative parameters included the type of surgery (laparoscopic or open), operative time, complications during hospital stay, blood loss, and blood transfusions. Intraoperative volume monitoring was done using central venous pressure using a catheter inserted through the right jugular vein. There were standard protocols for the management of HTN and hypotension. Sodium nitroprusside (SNP) was infused at the rate of 0.5–5 μg/kg/min. If needed, boluses of esmolol (10–20 mg) were used to control tachycardia. In addition, intravenous diltiazem was used in some patients apart from SNP for control of hypertensive crises. After isolation of the tumor, initial volume resuscitation was with crystalloids and if hypotension, defined by systolic blood pressure below 90 mmHg, did not respond to crystalloid infusion, 500–1000 ml of colloids (hydroxyethyl starch 6%) was used. The initial choice of vasopressors for the treatment of hypotension after volume resuscitation was noradrenaline (used as infusion at the rate of 2–20 mcg/min). Other vasopressors, adrenaline, dopamine, and vasopressin were added for refractory hypotension. Blood glucose levels were monitored every hour for at least 12 h in the immediate postoperative period and every 4 h thereafter. Postoperative intravenous fluids were given at rate of 2 ml/kg/h till patients could start oral intake. The choice of intravenous fluids was Ringer's lactate or acetate which was changed to 5% dextrose normal saline if at any time, blood glucose values dropped below 120 mg/dL. Hypoglycemia was defined as blood glucose values <80 mg/dL and was treated with 50% glucose bolus. Postoperative blood pressure and sugars levels were monitored as required during Intensive Care Unit (ICU) stay and 4 hourly after shifting to the wards till they reached a normal level or the patient was discharged. The dose and duration of inotropic agents and requirement of dextrose bolus were recorded in the database. The patients were reviewed at 2 weeks, 6 weeks, and 3 months after surgery with blood pressure and blood sugar measurement at each visit. BMI and QoL were again recorded at 3 months. Patients requiring antihypertensive or antihyperglycemic medication at 3 months were labeled as persistent HTN and DM, respectively. The data collected were entered into a database and analyzed using the commercial software at the end of the study to assess for preoperative and intraoperative parameters that may have impacted outcome parameters. Data were analyzed using STATA Version 12 and presented in mean ± standard deviation or median (range). Categorical values were presented as frequency (percentage). Categorical variables were compared using Chi-square test and Wilcoxon rank sum test was used for comparison of continuous variables. Within-group changes in scores were analyzed using paired t-test. Spearman correlation coefficient was used to see the correlation between two continuous variables. P < 0.05 was considered statistically significant. During the study period, 26 patients fulfilled the inclusion criteria including 13 men and 13 women. Their mean age was 39.6 years (range 21–71 years) and the mean duration of symptoms was 26.6 months (range 2–60 months). The cohort included 21 PC patients and 5 patients with PGs who underwent 31 procedures, including 5 bilateral adrenalectomies. Seven of these patients had hereditary syndromes including five patients with multiple endocrine neoplasia (MEN-2) syndrome, and two patients with von Hippel–Lindau disease, while 19 patients had sporadic PC. Twenty-three patients underwent laparoscopic surgery, while three patients underwent open surgery. Out of these three open cases, two were performed for interaortocaval PG which required extensive dissection and liver mobilization. The third case was a laparoscopic converted to open right adrenalectomy due to blood loss from the inferior vena cava. The surgical parameters are shown in [Table 1]. Out of the 26 patients, 23 completed the follow-up of 3 months and were included for the evaluation of persistent HTN and DM, change in BMI, and QoL evaluation. However, all 26 patients were included for evaluation of perioperative outcomes. Eight patients (30.8%) required inotropic support in the postoperative period. All these patients developed hypotension in the immediate postoperative period and no patient developed delayed onset hypotension. Noradrenaline infusion was started as the initial inotrope. Two patients required adrenaline infusion along with noradrenaline, while one patient also required dopamine infusion. The mean duration of noradrenaline infusion was 18.6 h (2–48) and the mean dose required was 8.4 μg/min (4–20). The occurrence of hypotension was associated with daily dose of prazosin (P = 0.044) and preoperative 24-h urinary vanillylmandelic acid (VMA) (P = 0.026). Spearman correlation coefficient between urinary VMA and daily dose of prazosin was 0.5 which was statistically significant (P = 0.045). [Table 2] shows these correlations. Four patients developed hypoglycemia requiring dextrose infusion after tumor removal. Only one of them had diabetes at presentation. Three of these four patients developed hypoglycemia in the first 4 h after surgery, while one patient developed it after 12 h. These patients required dextrose infusion for a mean duration of 29 h (16–40 h) and none of these patients developed further hypoglycemia once dextrose infusion was stopped. On univariate analysis, no correlation was found between the need for dextrose infusion with any demographic factor, clinical history, or tumor characteristics, as well as preoperative catecholamine levels. Twenty-one patients were hypertensive at presentation and 7 (33.3%) of these persisted to have HTN at 3 months, requiring antihypertensive medication. All these patients were hypertensive at discharge and none of the previously normotensive patients developed new-onset HTN. Six of the 7 patients required reduced number and doses of antihypertensives compared to preoperative requirement while one patient continued to require same doses. On univariate analysis, significant association was found with age and DM at presentation (P = 0.041 and 0.045, respectively) and older patients or those with DM had a greater likelihood of persisting HTN [Table 3]. Receiver operating characteristic (ROC) curve analysis was done to determine the age cutoff above which this risk is high. 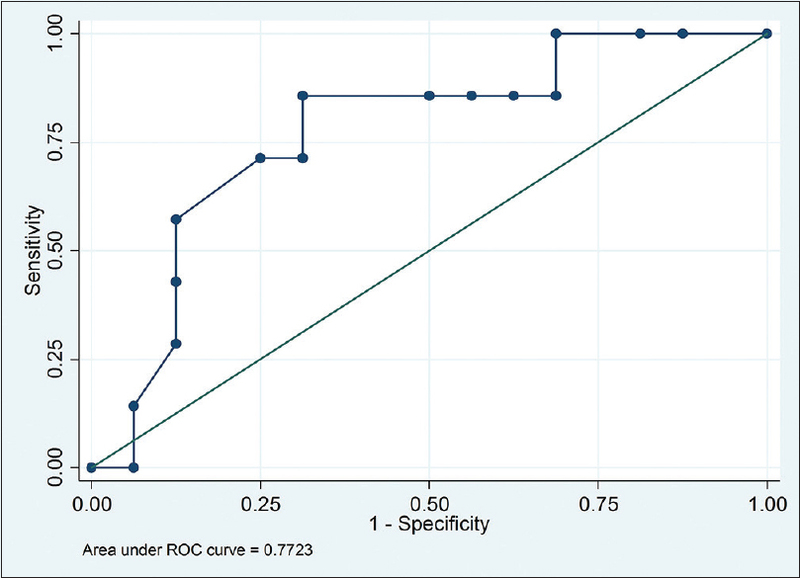 The area under the curve was 77.2% (95% confidence interval [CI] 55.74%–98.7%) and appropriate cutoff using ROC curve analysis was 39 years and above, with sensitivity of 85.7% and specificity of 68.75% [Figure 2]. Six patients had diabetes at presentation and only one remained diabetic 3 months after surgery. This patient was a known diabetic for over 5 years. Due to the single patient of persistent DM, no correlation analysis could be performed. There was significant increase in the mean BMI after surgery with a mean increase of 1.73 kg/m2 (P < 0.0001) [Table 4]. QoL score comparison showed significant increase in scores in physical, psychological, and environmental domains, postoperatively. There was also mild improvement in social domain with increase in score of 2.82; however, it did not reach statistical significance [Table 4]. After surgical removal of pheochromocytoma, patients are at risk for severe hypotension due to abrupt removal of catecholamines in circulation in the presence of continued alpha-blockade. This may result in ischemic end-organ damage and requires careful monitoring. Frequently, the patients need inotropic support to maintain the blood pressure. About 30.7% of patients in our study needed inotropic support. We found that the need for inotropic support correlated with total daily dose of alpha-blockers. It is possible that this is due to persisting alpha-blockade after tumor removal, causing unopposed vasodilation. Our findings are consistent with our earlier report that patients who have fewer intraoperative pressure spikes develop postoperative hypotension. This may be due to stronger and more prolonged alpha-blockade causing lesser intraoperative pressure surges and more postoperative hypotension. Our result is also in accordance with other studies assessing the effect of alpha-blockers on postoperative hypotension, which report the higher incidence of postoperative hypotension in patients receiving alpha-blockers as compared to calcium channel blockers, this effect is more pronounced after use of phenoxybenzamine and doxazosin, both long-acting alpha-blockers., Namekawa et al. also reported that the patients receiving higher doses of prazosin developed more postoperative hypotension, similar to our finding. The type and duration of preoperative preparation and extent of pressure control may need a rethink. Shao et al. have reported that there is no benefit of alpha-blockers in patients with normotensive PC for maintaining intraoperative hemodynamic stability. Instead, they increase the need for colloid infusion and use for vasoactive drugs. This may help avoid such episodes of hypotension but run the risk of intraoperative severe HTN. The need for inotropes was associated with preoperative 24-h urinary VMA levels. The patients with higher VMA levels required greater daily doses of prazosin to control blood pressure. This suggests that greater hormonal activity results in greater need of preoperative alpha-blockade and increases the risk of postoperative hypotension. However, we could not find any correlation between 24-h urinary noradrenaline and adrenaline with postoperative hypotension. The possible reason for this may be higher specificity of urinary VMA compared to catecholamine levels, and our small sample size. However, other authors have reported a significant association of preoperative catecholamine levels with postoperative hemodynamic instabilities. All patients who required inotropic support in our study developed hypotension either during surgery or within the first 6 h. Further, the patients who were normotensive at presentation remained so in the postoperative period. This data is important in developing a schedule for their postoperative management. It may be possible to decrease the ICU stay for these patients to 6–8 h as compared to a routine 24 h. Similar recommendation has also been made by Bénay et al. While four patients developed hypoglycemia requiring dextrose infusion, there were no predictive factors and nondiabetic patients were equally susceptible. Since one patient developed hypoglycemia after 12 h, the blood sugar monitoring should be continued for up to 24–48 h even in those patients who remain normoglycemic initially in the postoperative period. Plouin et al. reported that 15.15% patients suffered postoperative hypoglycemia requiring hypertonic glucose solution with no significant association with preoperative hyperglycemia, malignant pheochromocytoma, or plasma catecholamine concentrations. On the contrary, Chen et al. reported the association with serum 24-h urinary metanephrine and longer operative times with larger tumors. This complication occurred between 0.4 and 142 h postoperatively signifying the importance of prolonged blood sugar monitoring even after shifting the patient out of ICU. Pheochromocytoma surgery results in significant metabolic changes including resolution of HTN, diabetes, and favorable body fat distribution resulting in improvement in BMI.,, According to Pogorzelski et al., the largest improvement in HTN and diabetes occurs between discharge and 3 months of surgery and continued benefits have been observed till 1-year follow-up. The prevalence of persistent HTN ranges from 7% to 58% after pheochromocytoma surgery.,, In our study, 33% patients continued to be hypertensive. We found that the only significant factors associated with persistent HTN was age of the patient (47 vs. 36 years, P = 0.04) and diabetes at presentation (4 vs. 2, P = 0.04). In a long-term follow-up study after pheochromocytoma surgery, Plouin et al. found that 30.6% of patients were persistently hypertensive at 1 year and age and family history of HTN were the only associated factors. They proposed that there may be component of essential HTN with increased age which continued to persist after PC removal. In another study, Sapienza et al. reported the prevalence of persistent HTN in 29% of patients and found that age was the only factor significantly associated with it. The association with DM at presentation with persistent HTN could be due to microvascular changes due to long-standing DM. The median duration of DM at presentation in patients with persistent HTN was 48 months (range, 12–60) as compared to 6 months for patients who did not remain hypertensive. We could not find any other study where DM has been found to associated with persistent HTN. Our sample size is small and will need a larger study to find this association. Significant populations of patients also continue to have glucose intolerance and require insulin in the postoperative period. Pogorzelski et al. reported that hypoglycemic drugs were discontinued in 70% of patients immediately following surgery while up to 90% were euglycemic during the 1-year follow-up. Spyroglou et al. recently reported that after 1 year, the prevalence of DM in PC patients was 9.3% (similar to the general population) as compared to 21% preoperatively. Only 1 of our 6 diabetic patients remained diabetic after surgery, suggesting a significant potential benefit of surgery. Another significant effect of pheochromocytoma is the catecholamine-induced hypermetabolic state which gives rise to weight loss despite normal appetite and food intake., Petrák et al. have reported the significant improvement in BMI and favorable distribution of body fat after adrenalectomy for pheochromocytoma in a small group of 17 patients. Spyroglue et al. also reported a significant increase in BMI at 1 year in their retrospective study comprising 43 PC patients. In a prospective study, Bosanka et al. reported a significant increase in BMI in 18 PC patients after 6 months of surgery. We found the significant increase in BMI after surgery with a mean increase of 1.73 kg/m2 (P = 0.0001) after 3 months of surgery. We also found a significant increase in QoL scores using WHO-BREF QOL questionnaire. Overall, there was significant improvement in self-reported QoL and the patients were most satisfied with their ability to resume work and routine activities and decreased hospital visits. We also observed that patients who experienced less improvement in QoL and BMI were those with hereditary syndromes, who had associated malignancies such as pancreatic tumor or thyroid carcinoma for which they had to visit the hospital repeatedly and undergo further surgical procedures. Brunt et al. reported improvement in symptoms in 37 patients of pheochromocytoma after surgery using SF-36 QoL questionnaire but did not provide any result in terms of QoL scores. Our study has some limitations. Our sample size is relatively small but pheochromocytomas are uncommon tumors and, unlike most previous studies, ours is a prospective study and was performed in a short 20-month period, thus limiting the impact of time-related variables on the outcomes. Another limitation was the inhomogeneity in preoperative catecholamine estimation, and therefore, the association with metanephrine levels could not be assessed. Postoperative hypotension requiring inotropic support occurs in 30% of patients undergoing pheochromocytoma surgery. This is more likely in patients with higher 24-h urinary VMA levels or those requiring higher doses of alpha-blockers. Hypotensive episodes occur within the first 6 h after surgery. Postoperative hypoglycemia occurs in 15% patients and may occur >12 h after surgery. Older patients or those with long-standing DM are more likely to have persistent HTN after surgery. Pheochromocytoma surgery also results in an improvement in the QoL of patients and an increase in their BMI. Bravo EL, Tagle R. Pheochromocytoma: State-of-the-art and future prospects. Endocr Rev 2003;24:539-53. Williams DT, Dann S, Wheeler MH. Phaeochromocytoma – Views on current management. Eur J Surg Oncol 2003;29:483-90. Kercher KW, Novitsky YW, Park A, Matthews BD, Litwin DE, Heniford BT, et al. Laparoscopic curative resection of pheochromocytomas. Ann Surg 2005;241:919-26. Lenders JW, Eisenhofer G, Mannelli M, Pacak K. Phaeochromocytoma. Lancet 2005;366:665-75. La Batide-Alanore A, Chatellier G, Plouin PF. Diabetes as a marker of pheochromocytoma in hypertensive patients. J Hypertens 2003;21:1703-7. Chen Y, Hodin RA, Pandolfi C, Ruan DT, McKenzie TJ. Hypoglycemia after resection of pheochromocytoma. Surgery 2014;156:1404-8. Khorram-Manesh A, Ahlman H, Nilsson O, Friberg P, Odén A, Stenström G, et al. Long-term outcome of a large series of patients surgically treated for pheochromocytoma. J Intern Med 2005;258:55-66. Pogorzelski R, Toutounchi S, Krajewska E, Fiszer P, Łykowski M, Zapała Ł, et al. The effect of surgical treatment of phaeochromocytoma on concomitant arterial hypertension and diabetes mellitus in a single-centre retrospective study. Cent European J Urol 2014;67:361-5. Spyroglou A, Adolf C, Hahner S, Quinkler M, Ladurner R, Reincke M, et al. Changes in body mass index in pheochromocytoma patients following adrenalectomy. Horm Metab Res 2017;49:208-13. Rao N, Ramachandran R, Tandon N, Singh P, Kumar R. Surgical and hemodynamic outcomes in pheochromocytoma surgery: A Prospective cohort study. Urology 2016;98:103-6. Bénay CE, Tahiri M, Lee L, Theodosopoulos E, Madani A, Feldman LS, et al. 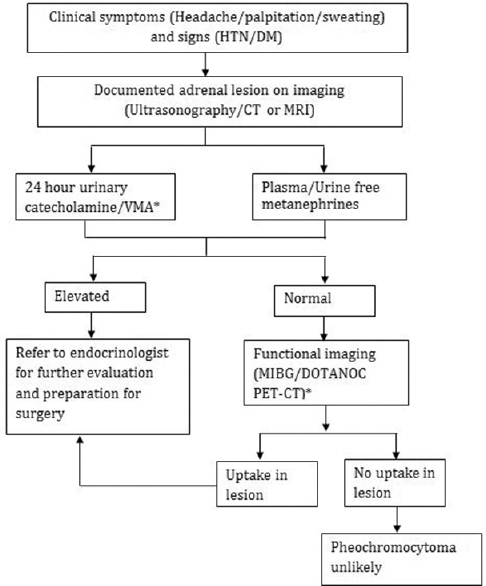 Selective strategy for intensive monitoring after pheochromocytoma resection. Surgery 2016;159:275-82. Brunaud L, Boutami M, Nguyen-Thi PL, Finnerty B, Germain A, Weryha G, et al. Both preoperative alpha and calcium channel blockade impact intraoperative hemodynamic stability similarly in the management of pheochromocytoma. Surgery 2014;156:1410-7. Namekawa T, Utsumi T, Kawamura K, Kamiya N, Imamoto T, Takiguchi T, et al. Clinical predictors of prolonged postresection hypotension after laparoscopic adrenalectomy for pheochromocytoma. Surgery 2016;159:763-70. Shao Y, Chen R, Shen ZJ, Teng Y, Huang P, Rui WB, et al. Preoperative alpha blockade for normotensive pheochromocytoma: Is it necessary? J Hypertens 2011;29:2429-32. Plouin PF, Duclos JM, Soppelsa F, Boublil G, Chatellier G. Factors associated with perioperative morbidity and mortality in patients with pheochromocytoma: Analysis of 165 operations at a single center. J Clin Endocrinol Metab 2001;86:1480-6. Yau JS, Li JK, Tam VH, Fung LM, Yeung CK, Chan KW, et al. Phaeochromocytoma in the Hong Kong Chinese population. Hong Kong Med J 2010;16:252-6. Kazic MR, Zivaljevic VR, Milan ZB, Paunovic IR. Perioperative risk factors, morbidity, and outcome of 145 patients during phaeochromocytoma resection. Acta Chir Belg 2011;111:223-7. Sapienza P, Cavallaro A. Persistent hypertension after removal of adrenal tumours. Eur J Surg 1999;165:187-92. Zelinka T, Eisenhofer G, Pacak K. Pheochromocytoma as a catecholamine producing tumor: Implications for clinical practice. Stress 2007;10:195-203. Petrák O, Haluzíková D, Kaválková P, Štrauch B, Rosa J, Holaj R, et al. Changes in energy metabolism in pheochromocytoma. J Clin Endocrinol Metab 2013;98:1651-8. Bosanska L, Petrak O, Zelinka T, Mraz M, Widimsky J Jr., Haluzik M, et al. The effect of pheochromocytoma treatment on subclinical inflammation and endocrine function of adipose tissue. Physiol Res 2009;58:319-25. Brunt LM, Moley JF, Doherty GM, Lairmore TC, DeBenedetti MK, Quasebarth MA, et al. Outcomes analysis in patients undergoing laparoscopic adrenalectomy for hormonally active adrenal tumors. Surgery 2001;130:629-34.